With nearly all of 2014 fading in the rear-view mirror, it's time to turn our attention to the year ahead. There will be a lot of tech trends playing out in 2015. Let's go over a few of the more compelling movements. It's now been a couple of years since the Kickstarter-funded Pebble ushered in the era of smart watches. Wristwatches that do more than tell time -- tethered to smartphones via Bluetooth to deliver calls and notifications, track your fitness, and run apps -- were supposed to be the next big thing in 2013 when Samsung entered the market. It didn't happen. This year has also been pretty unremarkable. All of that should change early next year, when Apple (AAPL) gets into the game. The Apple Watch is no longer a work of fanboy fiction. After years of rumors, Apple finally unveiled the tech giant's first foray into wearable computing, targeting a release just after this year's holiday season. As a tastemaker in tech, Apple is hard to ignore. The Apple Watch may initially be too expensive or limited to iPhone users, but it's hard to bet against this serial innovator. The company made portable media players, smartphones, and tablets cool. It could do the same thing to the smart watch next year. Uber has turned heads this year with its latest financing round, valuing the leader of peer-to-peer transportation at a cool $40 billion. Its nearest rival, Lyft, is also making waves. 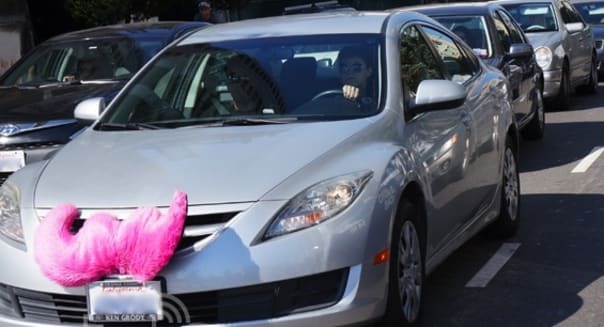 Uber and Lyft are pioneering a new approach to the cab industry. They are providing cheaper rides than traditional taxis, and the convenience of hailing a ride via app. They are also succeeding in getting drivers to sign up, arming the public with a cottage industry for folks to make the most of their vehicles that sit dormant most of the time. There have been and will continue to be regulatory challenges to the Uber model. A few nasty accidents or bad actors on either end of the transaction can dampen the appetite for peer-to-peer cab services. For now, it's red-hot and set to get hotter in 2015. Television manufacturers have had a pretty rough few years. The big push for 3-D televisions fizzled, and even the earlier Blu-ray rollout didn't trigger a massive wave of upgrades. However, the industry isn't going to stop trying, and the new push centers around 4K -- or Ultra-HD -- television. 4K TVs offer four times as many pixels as traditional high-def TVs. There's no shortage of debate as to how discernible the differences are for mainstream consumers, but folks love spec sheets. The holiday season kicked off late last month with many leading retailers offering 4K sets as doorbuster deals. Now that the leading streaming services have voiced support for 4K, it's a safe bet that consumers will want their next televisions to be 4K. One of the hot terms in consumer tech these days is "the Internet of Things" -- which basically describes devices that pair up with one another to perform functions. The best example is perhaps the Nest smart thermostat. It can be adjusted with an app from anywhere, but it also learns a home's behavior and sets the temperature accordingly. Google (GOOG) acquired Nest earlier this year, so we know what the search-engine giant thinks about the Internet of Things. From automated appliances to smart cars, the Internet of Things is starting to catch on. It's about time. Many folks figured that desktops and laptops were doomed when the tablet began to gain traction, but that isn't happening. Worldwide PC sales are still in a slump, but they posted a year-over-year and quarter-over-quarter increase in the U.S. during the third quarter, according to industry tracker IDC. Prices are getting lower, with Chromebooks gaining steam and Microsoft (MSFT) lowering the prices for Windows licenses. As tablet owners grow frustrated with computing limitations, they are returning to PCs. Motley Fool contributor Rick Munarriz has no position in any stocks mentioned. The Motley Fool recommends Apple and Google (A and C shares). The Motley Fool owns shares of Apple, Google (A and C shares), and Microsoft. Try any of our Foolish newsletter services free for 30 days. Check out our free report on the Apple Watch to learn where the real money is to be made for early investors.